A rice noodle roll (also translated as steamed rice roll) is a Cantonese dish from southern China including Hong Kong, commonly served either as a snack, small meal or as a variety of dim sum. 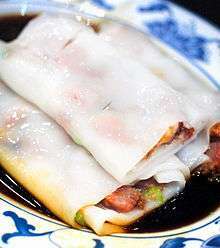 It is a thin roll made from a wide strip of shahe fen (rice noodles), filled with shrimp, pork, beef, vegetables, or other ingredients. Seasoned soy sauce -- sometimes with siu mei drippings -- is poured over the dish upon serving. When plain and made without filling, the rice noodle is also known as chee cheong fun where chee cheong means pig intestine, and fun means noodle; this is because the noodle is rolled more tightly and resembles the small intestine of a pig. The rice noodle sheets are made from a viscous mixture of 1 cup of rice flour and 1/4 cup tapioca or glutinous rice flour and water; this recipe will scale well as long as the ratio of flours and water remain the same. The combination of both types of flour and water should be a consistency of heavy cream. The rice flour serves as the bulk and flavor of rice, the tapioca flour gives the noodle elasticity and springiness; therefore, it should never crumble nor be too chewy. It should never have the al dente texture as with Italian pasta. Boric acid is sometimes used to make it have a very smooth texture or plastic sheen. Boric acid is banned for human consumption as a food ingredient in the United States, European Union, and developing countries as it may cause kidney failure. This liquid mixture is poured into a specially made flat pan with holes (similar to a flat colander). Commercial restaurants instead use special oversized steamers that are lined with a steam-permeable cloth. The noodle mixture is steamed in the pan from the bottom up to produce the square rice noodle sheets. The thickness of the noodle should be very thin (roughly 1⁄8 thickness), never thick, or it will have a gummy texture. Once the liquid mixture is ladled and set, the chef can add a filling such as shrimp or beef before the noodle is fully cooked. As the noodle is cooking, it will start to set around the filling and take hold without falling out when transferring from steamer to dish. After steaming for several minutes, the entire freshly steamed noodle is melded onto the cloth thereby the necessity to be scraped off with a scraper and onto a usually a metal table surface with a thin coat of oil to prevent sticking. The resulting freshly made noodle is lightly folded about three times. The resulting size is usually anywhere from 5 to 7 inches long by 3 inches wide. Traditionally, the noodles are finished with the addition of a warm, sweetened soy sauce just before serving. Cheong fun – Cantonese\Hong Kong style is usually lightly folded (about 3 inches wide and about 5–7 inches long) when there is a filling inside, resulting in a much more pleasing look rather than a rolled up as a fruit roll up. Two common Cantonese words are typically used to describe a well-made rice noodle roll: hoeng (香; "good aroma") and waat (滑; "smoothy"). The actual noodle by itself doesn't have much taste, it is just as bland as plain white steamed rice. The fillings and the soy sauce that accompanies it provides the bulk of the flavor. Traditional fillings are marinated fresh or dried shrimp, beef (heavily mixed with rice flour), or pork and chopped green onions. As mentioned earlier, presentation is very important when serving dim sum. 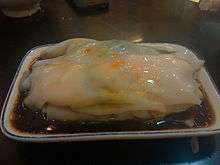 The rice noodle, when fully cooked, should be slightly transparent to slightly reveal the filling. If the edges after folding are not lined up then the edges are to be cut to get that even look, similar to getting the outer crust cut off a sandwich. The rice noodle roll is generally served in "threes" and usually scored to reveal the filling inside. Most other countries will roll them plain with no filling inside and instead serve them with toppings and a heavy/thick sauce on top. The rice noodle roll is always served hot and fresh and accompanied with a splash of plain or flavored (fried shallot) oil to give it a nice sheen and aroma with a generous amount of warm sweet soy sauce added right before serving. Most establishments will have a slightly different flavor of sweet soy sauce such as an addition of hoisin sauce. Rice noodle roll with dried shrimp (蝦米腸; Jyutping: haa1mai5 coeng4*2) -This style typically has the dried shrimp and scallions in the sheet itself rather than as a stuffing. Stir-fried rice noodle roll with XO sauce. This style uses chee cheong fun -either plain or with dried shrimp. A version of cheong fun notably absent outside of Guangzhou is the sliced meat filling variety. This variety is typically found in street side restaurants as a meal in itself, and uses whole meat pieces, typically beef or pork, rather than ground meat. Prior to rolling the crepe, briefly blanched lettuce or romaine is added as part of the filling, giving the rolled cheong fun a crunch as well as volume. In Vietnamese cuisine, there is a similar dish called bánh cuốn, and it is mostly eaten for breakfast. It is a crêpe-like roll made from a thin, wide sheet of rice noodle (similar to Shahe fen) that can be filled with ground pork and other ingredients. Sides for this dish usually consist of chả lụa (Vietnamese pork sausage) and bean sprouts, while the dipping sauce is called nước chấm. Sometimes, a drop of cà cuống, which is the essence of a giant water bug, Lethocerus indicus, is added to the nước chấm for extra flavor, although this ingredient is scarce and quite expensive. Malaysian chee cheong fun with chilli sauce and black sweet sauce. In Malaysia and Singapore, many people prefer serving chee cheong fun with a kind of black sweet sauce called tim cheong (甜酱). It is likely a variation of hoisin sauce. The popular Malaysian Penang version uses a shrimp paste called hae ko which is also black and sweet. Ipoh, being another food capital of Malaysia, chee cheong fun is mainly served in two ways, the dry or wet versions. In the 'dry version', it is served with soy sauce, sesame seeds, fried shallots, onion oil and in most cases, chilli sauce as well as pickled green chilli. In the 'wet version', it is served with curry and mushroom gravy, other than sesame seeds and fried shallots, giving Ipoh Chee Cheong Fun a rather distinctively Ipoh character. Chee cheong fun is a popular breakfast food in Singapore and Malaysia. Chee cheong fun is frequently served in kopitiams and Chinese restaurants. 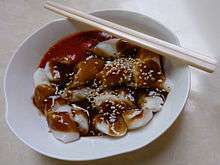 "Chee cheong fun" can also be found in Bagansiapiapi, a small town in Riau, Indonesia. It is called "tee long pan" or "tee cheong pan" in local Hokkian dialect. "Tee long pan" is served with red chilli sauce, crushed roasted-peanuts, fried onions, and dried shrimp. Wikimedia Commons has media related to Rice noodle roll. ↑ "晶莹剔透，香滑可口--肠粉". 美食天下 (in Chinese). Retrieved 14 July 2015. ↑ "的確涼布　拉出完美腸粉". Apple Daily (in Chinese). 2014-08-17. Retrieved 14 July 2015. ↑ "中式早餐　腸粉×粥最健康". The Sun (Hong Kong) (in Chinese). 2010-12-01. Retrieved 14 July 2015.